Keystone Camera Miracle of Light Ad 1958 This is a November 3, 1958 advertisement It is a nice color ad from Keystone Camera Co Inc of Boston. Ad shows a lady operating the camera and it reads, ""New from Keystone, lowest priced automatic electric eye turret movie cameras. The miracle of light energy sets the lens."" In excellent condition. Photo is taken through plastic and may show wrinkles or crookedness that is not in the ad. This magazine tear sheet measures 5 1/2"" wide by 14"" tall. 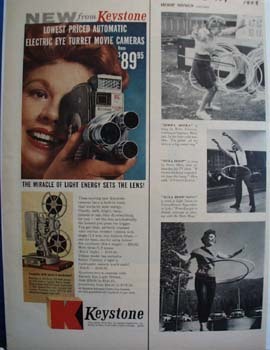 Items Similar To "Keystone Camera Miracle of Light Ad 1958"